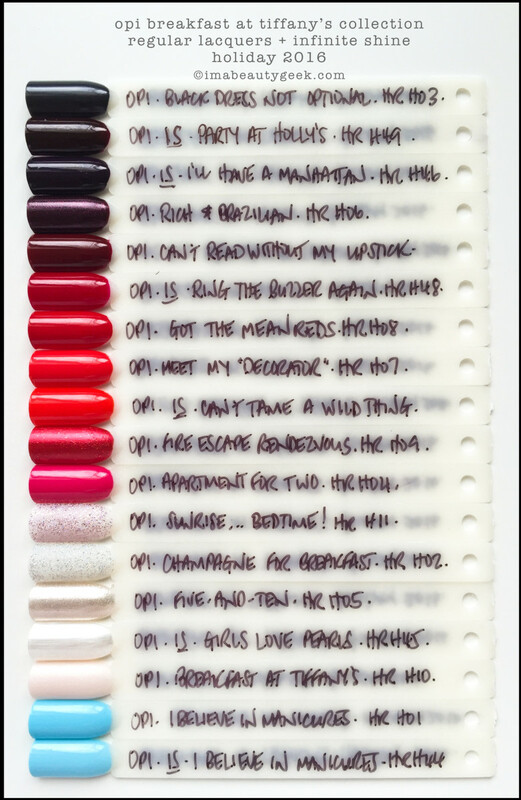 The OPI Breakfast at Tiffany’s Collection for Holiday 2016 lands on counter October 1st, 2016 and I have swatches! This year the Infinite Shine line also gets a showing. There are 12 limited-edition shades in regular lacquer, and 6 shades of Infinite Shine. The only one that repeats across the two lines is the I Believe in Manicures blue. Other than that, you’ve got your reds, your sparkles, your deep-darks, and of course, let’s not forget the possible addition to #ArchiveAtrocities. All swatches are naturally lit and if you&apos;ve seen my quick little Instagram painting videos, you know this is just me, the bottles, and zero photoshop. Also, please be kind: if you must lift an image to share it, please include a link back so my copy and images can stay together. 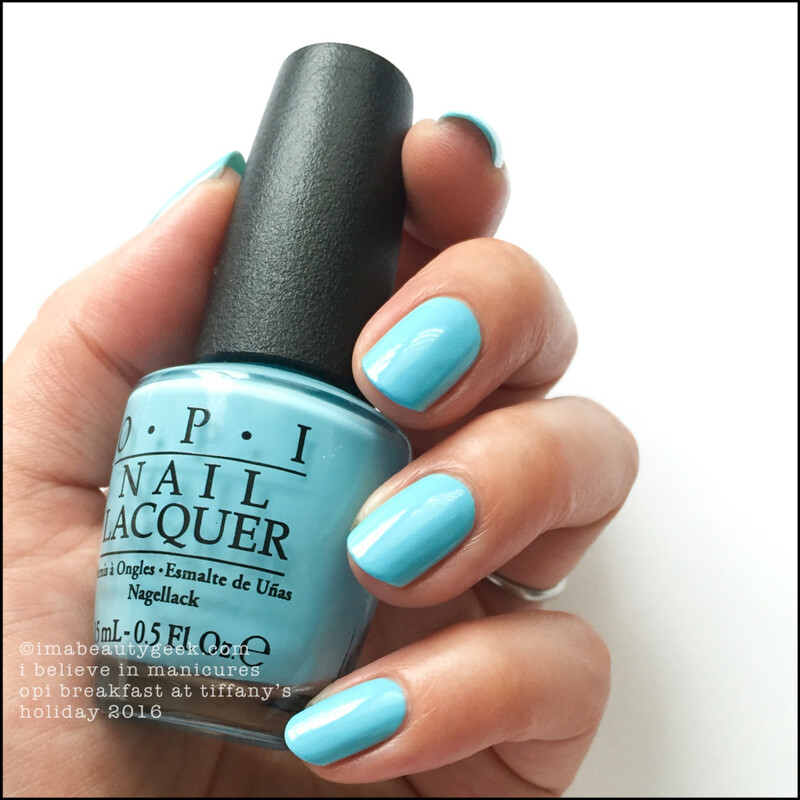 OPI I Believe in Manicures – OPI Breakfast at Tiffany’s Holiday 2016 (above). Before we really begin, how about a word about the inspiration for the collection? How about “OPI captures the essence of Audrey Hepburn as Holly Golightly with a collection that reflects both her classic beauty and sense of playfulness.” That do? OPI I Believe in Manicures (above). OPI is calling this a precious light blue and it is. It’s supremely clean lookin’ and remarkably not holiday-esque. That’s 3 coats (no top) but the formula is easy to work - just leave a slight dry time between coats. Use top to pop crazy shine, yes? OPI Champagne for Breakfast over I Believe in Manicures (above). Oooh! Liquid Sand sparkles! That’s 1 coat plus my Revlon Quick Dry Top Coat over the blue and that’s the perfect amount for me. Subtle and sophisticated, huh? There’s a bunch of holo glitter bits in there but what’s really in there appears to be super-fine white sand à la Liquid Sand. Yes it&apos;s textured. Yes, it will eat top coat. I’ve decided this was designed to be used on top of other shades just because right now, I have 5 coats (of just this) on my thumb and I can still see through it. There’s plenty of sparkle though and that’s fun. 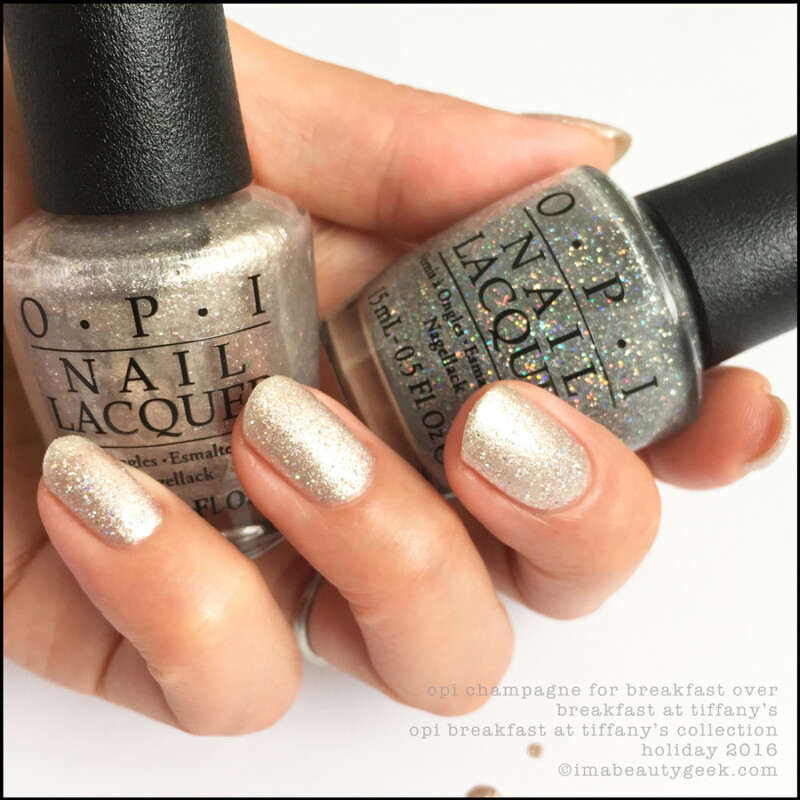 OPI Breakfast at Tiffany’s – Holiday Collection 2016 (above). It’s “a matte pearl for early morning window shopping”. Huh. Who’d have guessed that? But you know what? I think it’s pretty. It’s got little iridescent flecky bits in there that give it much more life than you’d ever expect in a matte. And can we talk about the formula? Amazeballz. 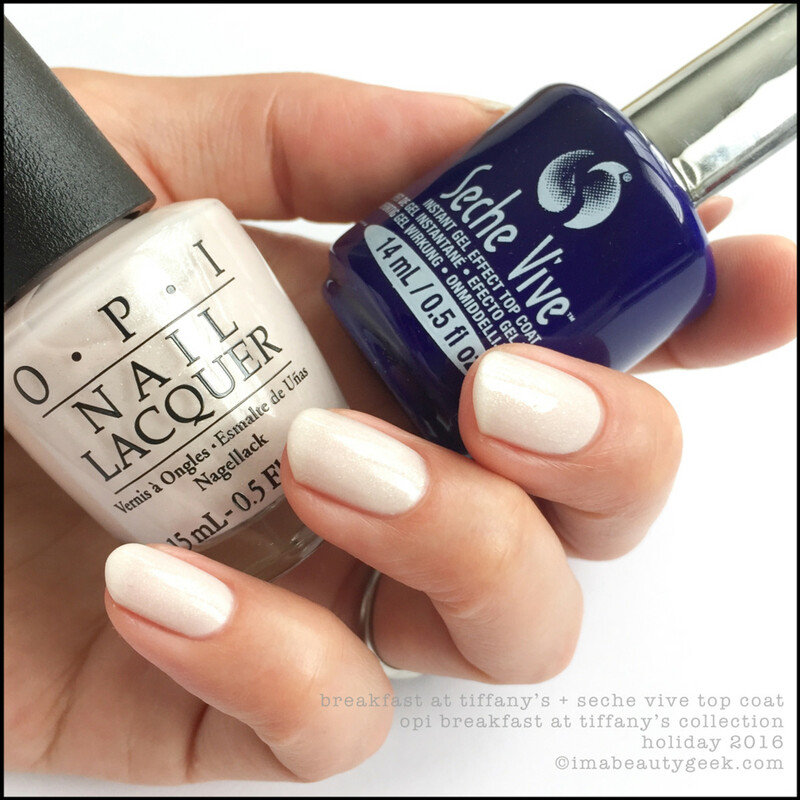 OPI Breakfast at Tiffany’s with Seche Vive Top Coat (above). Oh yes, not Vite, but Vive. Why? Because it’s on my desk. Do I like the shade better with Seche Vive top coat? Uh huh. By a lot. Without top, it pulls too bland with my particular skin tone. With top, it’s unquestionably a winner. 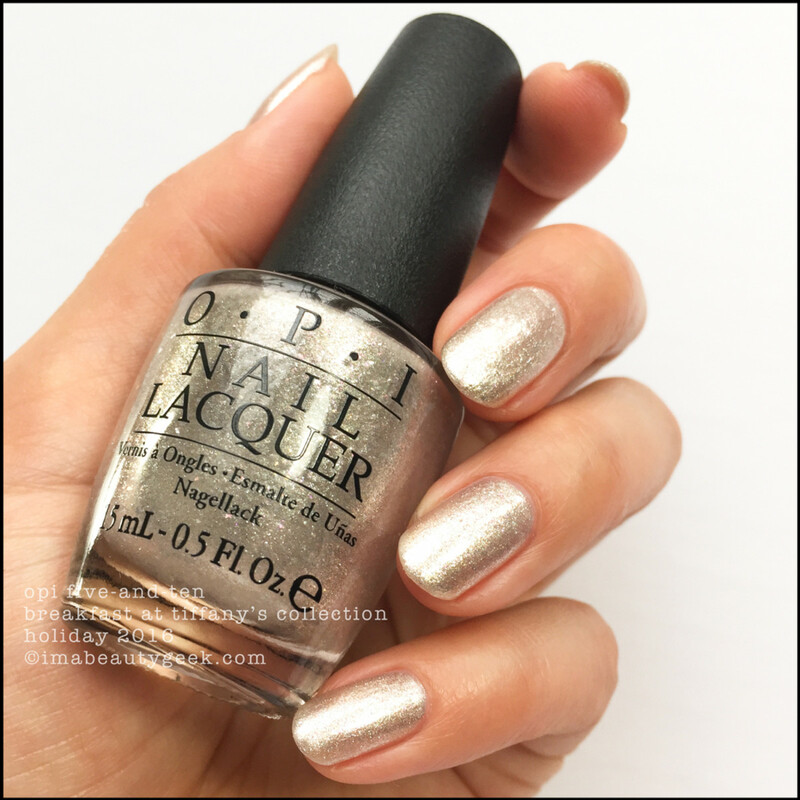 OPI Five-and-Ten – OPI Holiday 2016 (above). My notes say “crazy-cool foil-y finish with tonnes of colours in there! At least 3 coats to opaque. I did NOT expect to like this but I really, really do!” That’s exactly what my notes say. OPI Champagne for Breakfast over OPI Five-and Ten (above). I just wanted to see what would happen if I slapped 1 coat of this over my 3 coats of that. Now we both know. OPI Black Dress Not Optional (above). It’s shimmery charcoal grey and the first coat is kind of watercolour-y and somewhat scary. Don’t worry, it comes together and finishes beautifully on the second coat. It’s more of a satin finish so you may or may not want to add top coat. OPI Black Dress Not Optional with Revlon Quick Dry Top Coat (above). Shiny and definitely not black. It’s good. I likes. 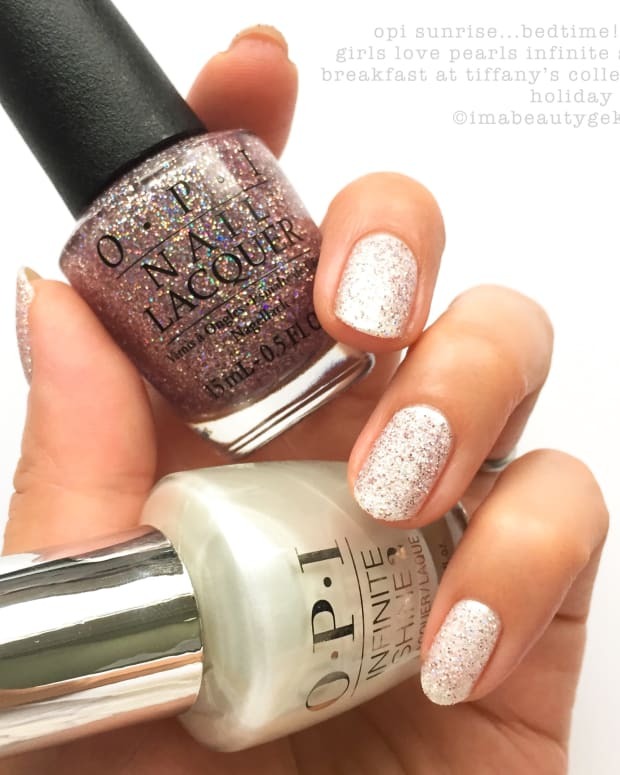 OPI Apartment for Two – OPI Holiday 2016 (above). This formula is great in 2 but depending on your application, you might be able to run out the door in 1. Oh! And that’s with top coat. 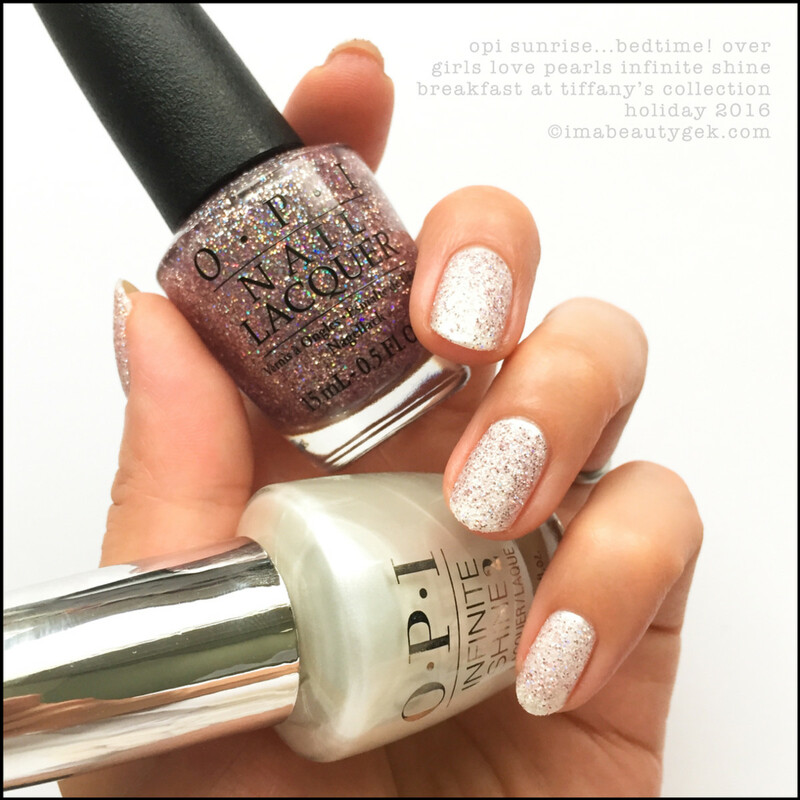 OPI Meet My “Decorator” – OPI Holiday 2016 (above). OPI is calling this “a hot little red for rendezvous and other “meetings” but I’m going to call it a saturated poppy orange with a goooooood formula. I love this shade a whole lot. It’s just so incredibly vibrant. It makes me smile. 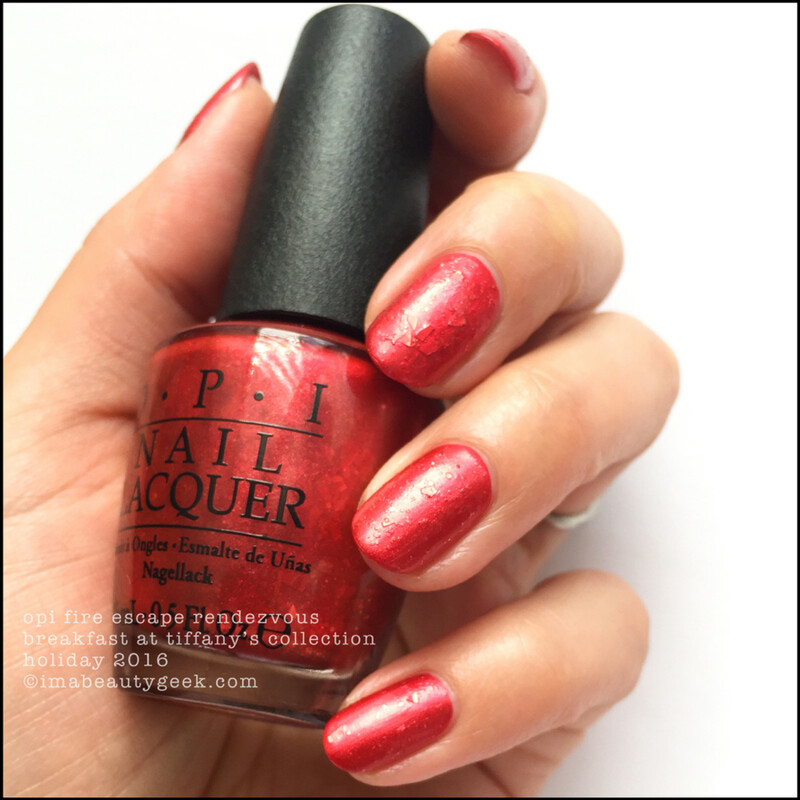 OPI Fire Escape Rendezvous – OPI Holiday 2016 (above). Wanna know what OPI says? “Make a date with this matte, glittery ruby”. That’s 2 coats by the way – no top. Wanna see it with top? OPI Fire Escape Rendezvous (above). My notes? “It’s not terrible. 2 coats. Needs top. And a blindfold. Ha! !” I gotta say I’m almost in love with this polish simply because it meets all my WTF expectations for this OPI holiday collection. Truthfully? On someone else, from far away, it’s probably okay. This close? No. *shudders*. 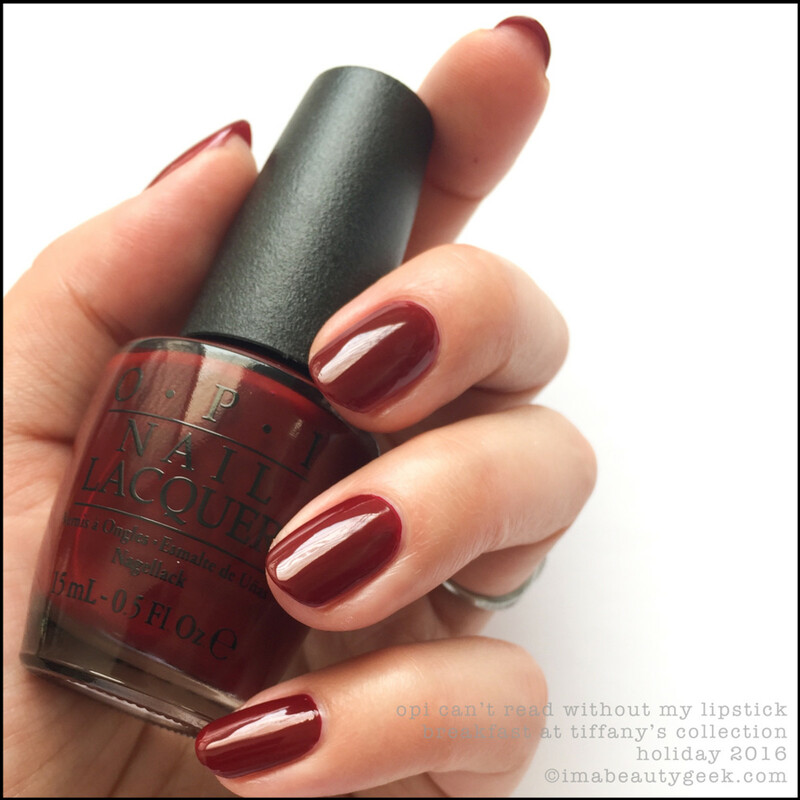 OPI Got the Mean Reds – Holiday 2016 (above). That’s 2 coats. Can you do 1? Sure, but it’ll show a little lighter – doable though – 100% doable. Again, not crazy shiny so I added top. Oh! And she totally nailed my sidewalls on removal so learn from my mistakes and no twisting on removal, k? 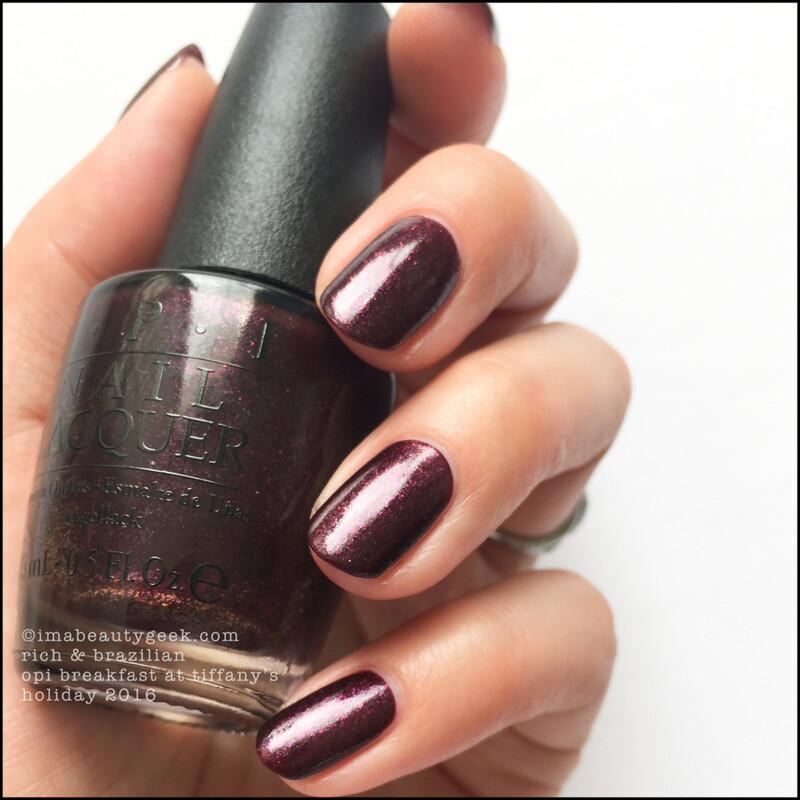 OPI Can’t Read Without My Lipstick – OPI Holiday 2016 (above). Swatchers the world over are terrified of this particular shade of oxblood maroon. This one is no different. It’s a plasticized jelly-like thing that I found steaky and patchy in 2 so this is 3. I will say I was scared stiff of staining so my application was pretty slow – that could account for my streaks, patches, and need for a 3rd coat. If you’re not a chicken like me, you might be able to slap this on in 2. 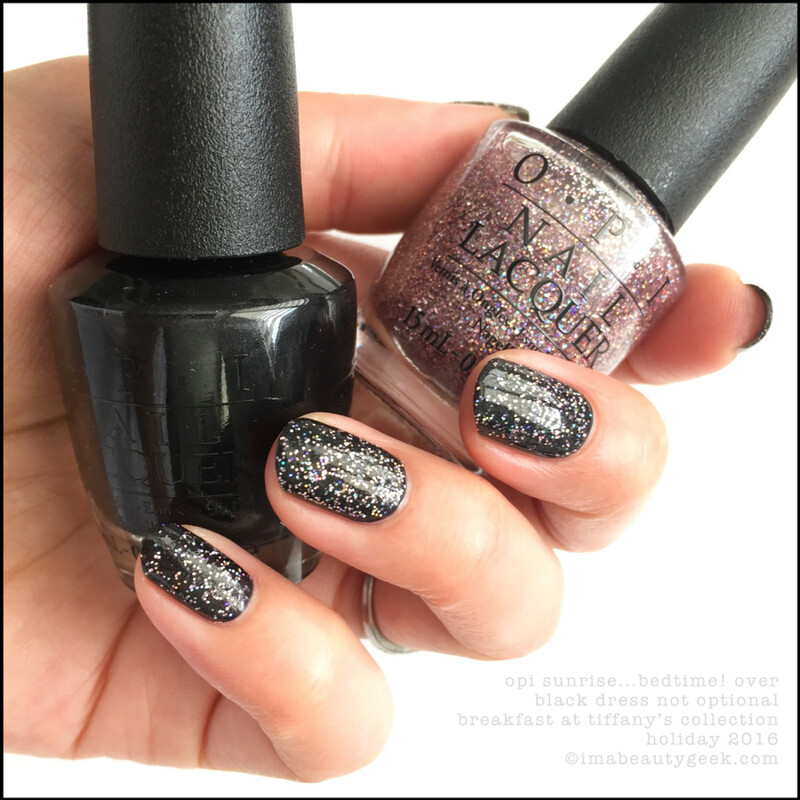 OPI Rich & Brazilian – OPI Breakfast at Tiffany’s Holiday 2016 (above). Unhhh. Love. Eggplanty and flecky shimmery goodness with a satin finish. 2 coats. 2 easy, happy coats. OPI Rich & Brazilian with Top Coat (above). Yes please. 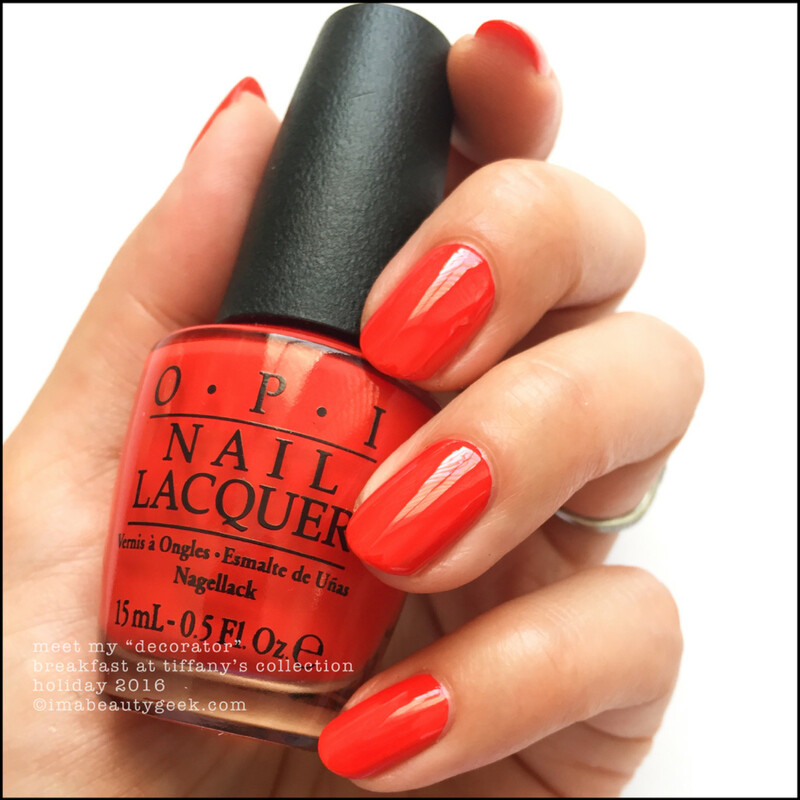 OPI Sunrise… Bedtime! over OPI Infinite Shine Girls Love Pearls (above). A much better use of Sunrise… Bedtime! That’s one coat of the Liquid Sand textured polish over the super-frosty Girls Love Pearls from the Breakfast at Tiffany’s Infinite Shine collection. I’m gonna put Infinite Shines & Comparison Swatches here because this one is pretty long already. And that’s the 12 limited-edition lacquers ($10USD/$13.50CAD). There’s also the 6 Infinite Shines ($12.50USD/$13.50CAD) still to show you, and I don’t play GelColor (it’s pro-only) but I can tell you the GelColor shades mirror the regular polish line. 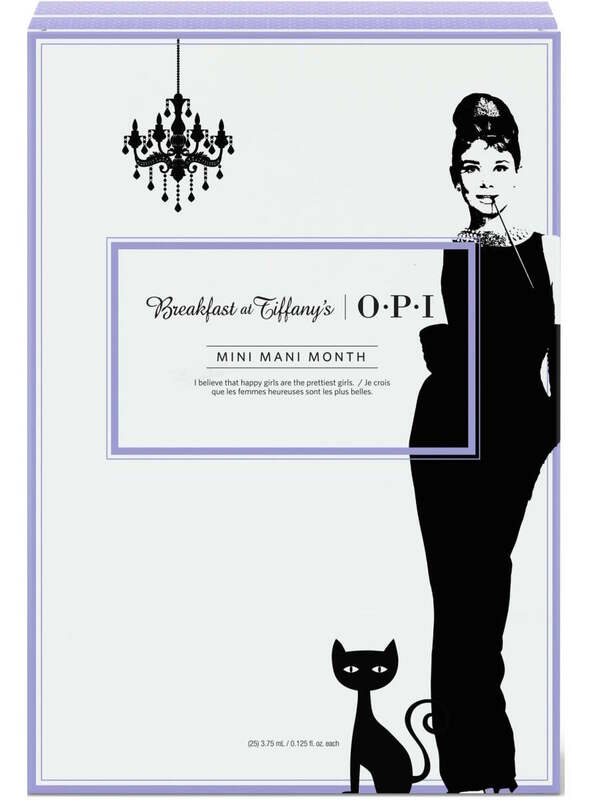 There are a whack OPI Breakfast at Tiffany’s Holiday 2016 mini sets, Avojuices, and gifty things too - like this 25 mini set called OPI Mini Mani Month. Everything should be available October 1, 2016 from places like ulta.com and thebay.com. If you can&apos;t wait, it&apos;s already available at my favourite SparkleCanada.com, on ebay, amazon.com, and from other assorted online sellers. Of course, “OPI is only guaranteed if you buy it from authorized professional beauty outlets and prestige stores, not from a drugstore, supermarket, mass outlet, or other unauthorized source.” For more information, visit opi.com. So, what do we think, fellow polish nerdies? Do we like? 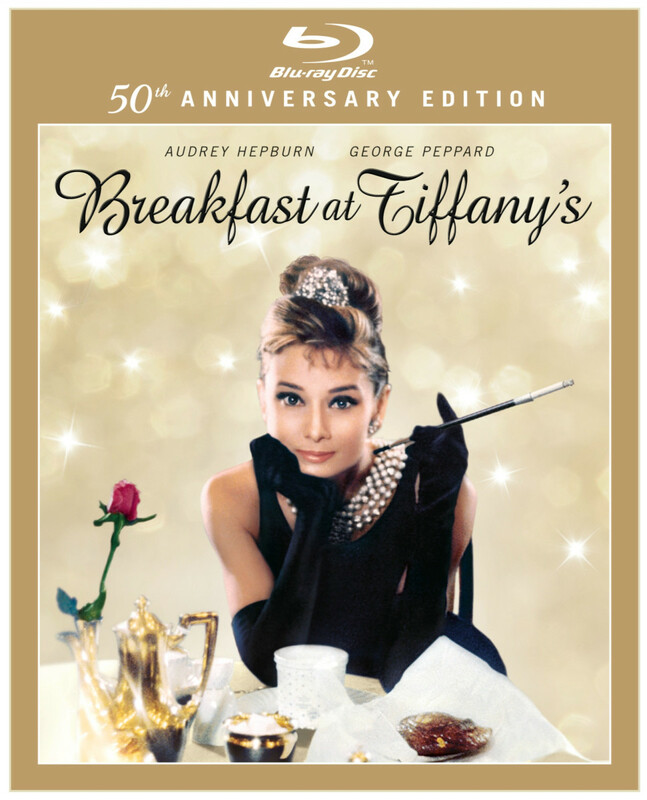 Does it accurately reflect the Breakfast at Tiffany&apos;s movie I&apos;ve never seen? Does it feel Holiday to you? Do we already have things on our #GimmeThat List? Are we bored? Me? I’m pretty happy. 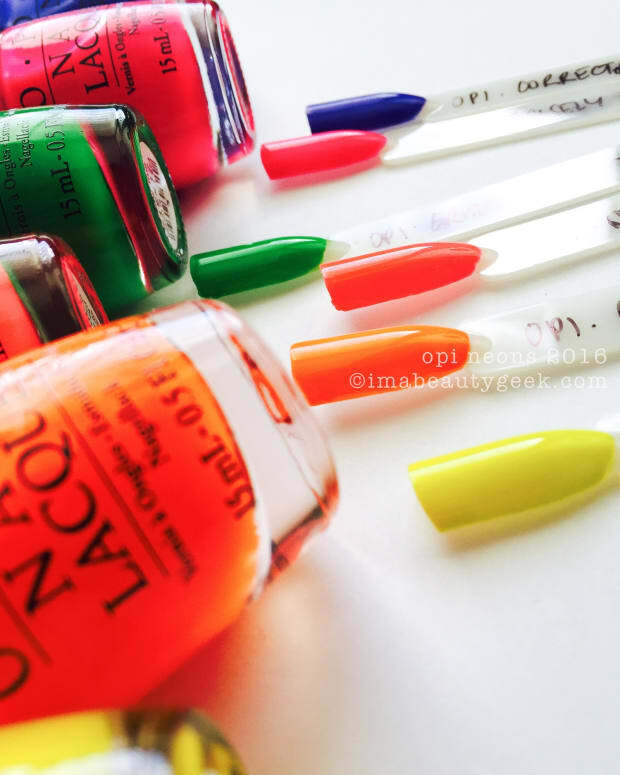 The formulas were all fairly good and when application is easy, it reminds me why I love OPI. I got my fingers crossed the IS shades are equally as perfect. Oh - in case you missed ‘em, here are the handy lazy links to the OPI Infinite Shine Iconic Collection, the OPI Washington DC F/W 2016 Collection, and our sneak peek at OPI Fiji Spring/Summer 2017.